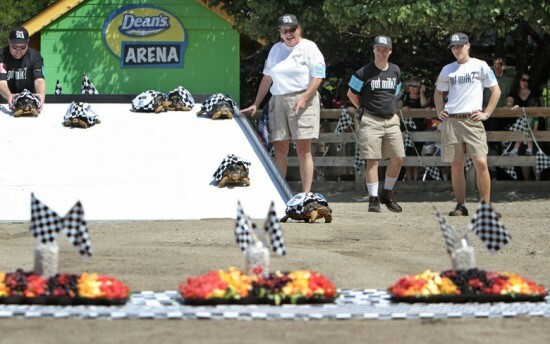 While the Indianapolis 500 is the undisputed main event in America’s Circle City, it’s probably not as fun as the Zoopolis 500, a turtle race preceding the big motor race. Kids and their families look forward to the Zoopolis 500 race, every year, because even though it lacks the speed of the Indianapolis 500, racers give it their all to put on a good show. 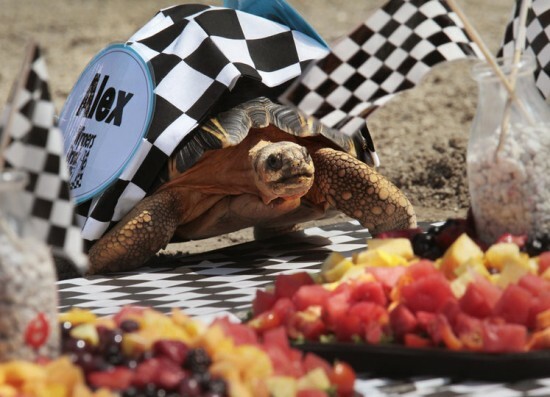 Yesterday, the Indianapolis Zoo hosted the 30th annual Zoopolis 500, featuring five radiated turtles competing for the best prize they could wish for – a big plate of delicious fruit. Competitors were named after IndyCar drivers Dan Wheldon, Simona De Silvestro, Alex Tagliani, Ed Carpenter and Scott Dixon. The race flag went down at 11.30, and as you can imagine, the turtles were off to a pretty slow start, ignoring the excitement and cheering that went on around them. They even went the wrong way a few times, but managed to get back on track with the help of zoo keepers. IndyCar legend Tony Kanaan, who acted as Grand Marshall for the event, tried to give Simona an edge by placing some fruit in front of her, but the tortoise just stopped for a bite. In the end, it was Dan who crossed the finish line first and got to feast on the fruit, and many said it was an omen that Dan Wheldon will win this year’s Indianapolis 500.